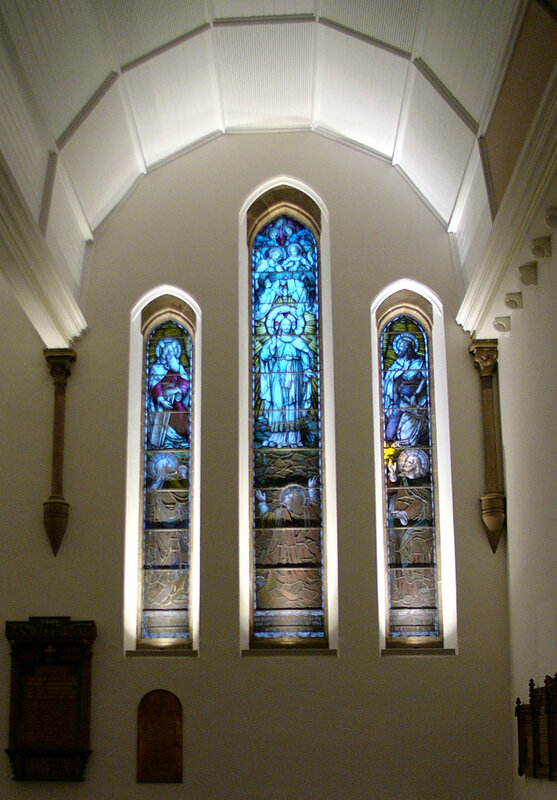 The lighting design of Mayfield Salisbury Parish Church provides the congregation with three main spaces to enjoy; the main aisle and two adjacent transepts. The design is carefully controlled through preset lighting scenes, providing the church with eight varying lighting scenarios to work with. Such scenes include Good Friday, Main Sunday Service and Small Chancel Service. As described by the minister, the lighting should provide a sense of drama, portraying sermons with a likeness to acting, thus giving the altar the persona of a stage. High level fluorescent cove lighting highlights the undulating form of the vaulted ceiling, creating an intricate expanse of light over the main congregation. Directional theatrical spotlights concealed within the roof space provide accent lighting through plaster cutouts within the ceiling. The theatrical light fittings provide brilliant colour rendering and excellent light levels to the congregation and transept areas below. Mayfield Salisbury Parish Church provides the congregation with three main spaces to enjoy; the main aisle and two adjacent transepts.